The Glide automobile was an American automobile manufactured by the Bartholomew Company in Peoria Heights, Illinois beginning in 1902. Founded by John B. Bartholomew, the company continued to produce automobiles until 1920, when the company began manufacturing trucks for the Avery Company, of which Bartholomew was also president. J. B. Bartholomew started with the Avery Company in Galesburg, Illinois on December 8, 1879 driving a team to haul lumber for a US$1.10 per day. In 1882 the Avery company purchased 18 acres (73,000 m2) in Peoria, Illinois and moved the business there to North Adams and North Jefferson Streets. In 1892, Robert Avery, the president of the Avery Co., died and Bartholomew was made vice-president. In 1901 Batholomew began experimenting with automobile manufacturing, and in 1902 he added automobiles to the Bartholomew Company production line. Their slogan was "Ride in a Glide, Then Decide. ":629 They made a total of seven models, though never more than 500 cars in a year, and usually less. :629 The first car was a 6 hp (4.5 kW) single-cylinder tiller-steered runabout named the Glidemobile. 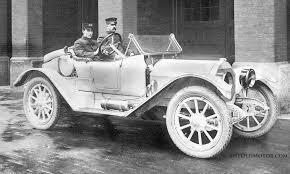 By 1904, they had added a steering wheel and increased the engine to 8 hp (6.0 kW). The engine was positioned horizontally under the seat, featured a single chain-drive and an optional tonneau top. The two-seater sold for US$750, and the tonneau top for US$850. About 25 were sold in 1903 and twice that in 1904. In 1920, as competition from Buick and Studebaker increased,:630 Bartholomew decided to bring the plant into the Avery Company fold and it was utilized to manufacture trucks. Avery Company employed four thousand people by this point, but went into bankruptcy and receivership in 1923. President J. B. Bartholomew died in 1924.